The osmena pearl has a bluish silver luster. This version is knotted with dark navy blue nylon and a pale blue silk surround, lavender and sea blue flowers and a heliotrope colored leaf. Heliotrope is a garden flower that comes in a variety of bluish purples. To be worn on a lapel or sweater, or as a closure for a scarf or shawl. This piece would be beautiful on a pearl grey suit. 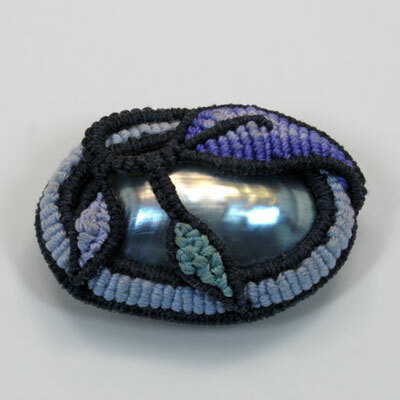 Brooch: 1 3/4 inches by 1 1/4 inches . Osmena pearl. Silk filament thread and spun floss. Nylon cord. Copper armatures. Leather lining.